Welcome to Master Art Workshops. 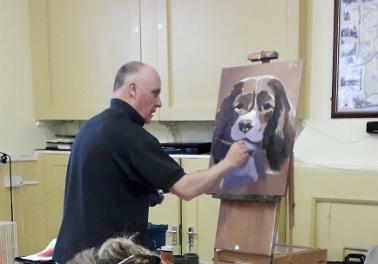 We specialise in Saturday Art Workshops for all ability students using all mediums - watercolour, acrylics, pastel and oils. The Venue is Little Berkhamsted Village Hall and we provide a two course lunch and all day refreshments. We pride ourselves on home cooking all the way! Workshops times are usually 10am to 4pm. FANTASTIC WORKSHOP YESTERDAY! EVERYONE LEARNT SUCH A LOT - THANK YOU DAVE! Joan Wandsworth and Angie Piggott formed Master Art Workshops in 2010 following many weekend visits away painting with inspirational artists. We approached these artists to see if they would travel to Hertfordshire and spend a day inspiring others like ourselves in a workshop format which would include a nice lunch , plenty of teas and coffees to boost the adrenalin and allow all students to leave with a painting at the end of the day. Hence Master Art Workshops! Sue Jelley, Hash and Jamel Akib, Ali Lindley, Roger Dellar, Jake Winkle, Soraya French, Liz Seward, Tim Fisher, Roy Holding, Joe Dowden, Barry Herniman, Sera Knight, Wendy Jelbert and the list goes on! We extend our sincere thanks to everyone that has supported us over these past years - without you and your recommendations to your friends this venture would not have been so successful. PLEASE "LIKE" US ON OUR FACE BOOK PAGE IF YOU'VE ENJOYED A WORKSHOP!